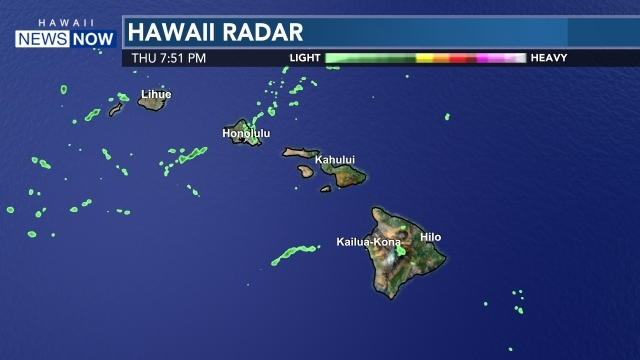 HONOLULU (HawaiiNewsNow) - Tropical Depression Kilo remains on a track south-southwest of Kauai, with the potential to restrengthen into a tropical storm as it moves farther away from the Hawaiian islands, according to the Central Pacific Hurricane Center. The forecast track passes west of the state, but the CPHC still said "interests in the western main Hawaiian islands, as well as the eastern portions of the Papahanaumokuakea National Marine Monument should monitor the progress of Kilo over the next several days." A Tropical Storm Warning was issued for Johnston Island at 11 p.m. on Sunday, which means that tropical storm conditions are expected within the next 36 hours. Johnston Atoll is currently a National Wildlife Refuge. The tropical depression remains over very warm sea surface temperatures with relatively weak shear. If Kilo can get better organized, forecasters expect it to intensify slowly and reach Tropical Storm strength on Monday. The Pacific Ocean has been extremely active throughout this hurricane season with the most intense storms developing over the Western Pacific. Seven tropical systems have formed or crossed into the Central Pacific basin so far this year. Secure loose outdoor objects that might be blown away by high winds, and become flying debris. Boats should be moored securely, or moved to a designated safe area well before the storm arrives. Windows should be boarded up. Larger windows may be broken by wind pressure, while smaller windows are mainly damaged by wind driven debris. If evacuation is required, be sure to take your disaster supply kit when leaving for a designated shelter. Keep in mind that evacuation routes may become flooded or cut off, even before the full force of the tropical cyclone arrives. Check out our special Hawaii News Now Hurricane Center by downloading our news app. Also get real-time access to severe weather alerts. Download the HNN Weather App.